With our Nimbus 37ft flybridge on hand we can usually offer any course at short notice. Our RYA motor cruising courses all include accommodation on board a large yacht at no extra charge, but this must be booked in advanced via our website booking system if required. RYA motor cruising courses are the gateway to the ICC certificate. In order to skipper a motorboat over 10m in length in international waters you will need to hold the RYA Day Skipper Practical Motor Cruising Course certificate which converts to the ICC certificate. Our proven experience in RYA motor cruiser training helped us be picked to be the RYA training provider at the Southampton international boat show for many years. 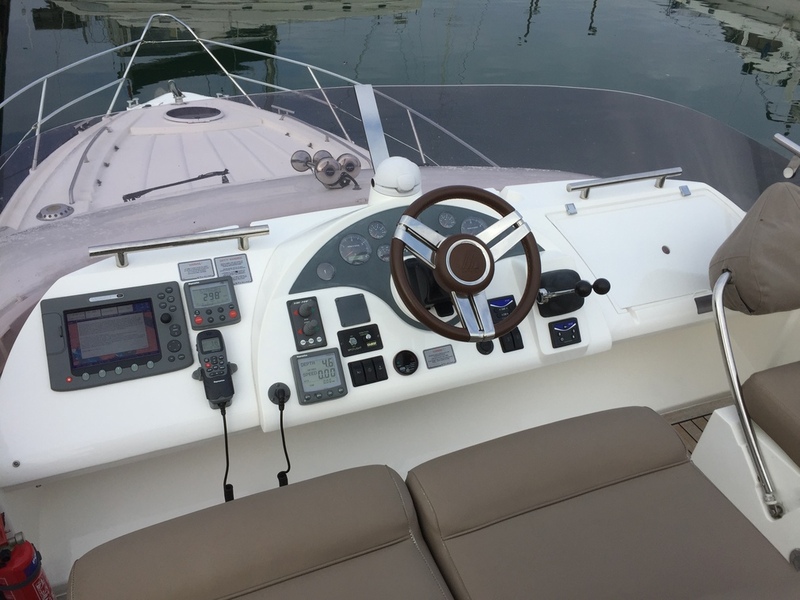 Aimed at the beginner or a new owner of a motor cruiser this 2 day course teaches the basics of motor cruiser setup, safety and control at a cost of £499 per person. We find most students have taken the powerboat level 2 course, but this is not a requirement for the Helmsman course. We run this RYA course on our Fairline Phantom 40 flybridge motorboat but can run SBT handling courses on our larger Fairline Phantom 40 on request. 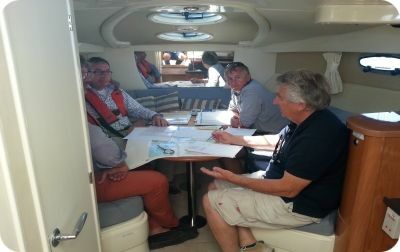 More details of the RYA Motor Cruising Helmsman Course here. The course aims to teach pilotage, navigation, seamanship and boat handling to the standard required to skipper a motor cruiser safely by day in tidal waters with which the student is familiar. Over the 4 days of the course you will also receive an introduction to making a night passage. 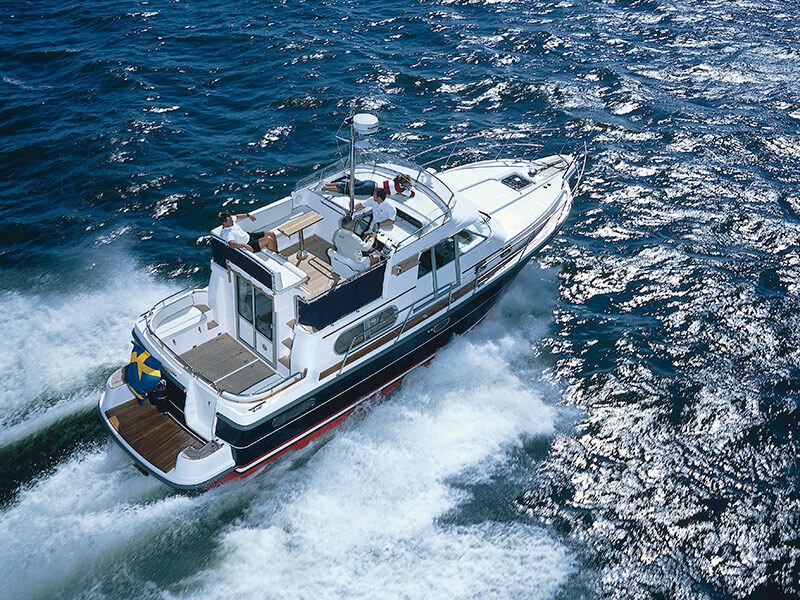 Costing £999 per person on our Nimbis 37ft flybridge motorboat This course will allow you to apply for the ICC certificate for any size of pleasure motor boat. More details of the RYA Motor Cruising Day Skipper Course here. The 5 day coastal skipper course costs £1299 per person for the high quality experience that builds on your day skipper skills. All of our motor cruising courses, from RYA helmsman to theory courses, are provided by experienced instructors, each one being hand-picked based on their experience, ability and local knowledge. This ensures an exceptional level of RYA motor cruising training can be provided to all clients no matter what their needs may be, and because we own all of our boats (unlike many powerboat training providers) you can be sure of getting the best. Our extensive fleet ensures we’re able to offer motor cruising training of all kinds to meet the needs of a whole range of individuals, and with all of our RYA motor boat courses being top-quality yet highly affordable you’ve got the best of both worlds. We can even offer something else into the mix - flexibility. We’re able to provide an exceptional level of flexibility in terms of motorboat training dates and times, so no matter when you want to begin your motor cruising courses we’re confident that we’ll be able to accommodate. Most of our courses are offered year-round subject to demand, and if you’d like to make a booking just get in touch or use our easy online booking system to see what’s available. Plus, many of our motor cruising courses can be run with up to three students at any one time, with great discounts being available if you invest in group training instead of going it alone. If you only require an ICC certificate for boating abroad try our own SBT 4 day preparation and exam course which we run for private groups of up to 4 students for £2999.